I appreciate you my readers, your visits and all of your “likes” and comments. I love it when you offer suggestions for what I will make next. So I thought it would be fun for you to vote on the type of bento I will make. Please vote below. In the comments, offer specific suggestions if you want. Voting is open until Sunday May 12. Voting is now closed. See results below. On Friday May 17, I will post the bento influenced by you. This entry was posted in Bento / Cute Food, Blog. Bookmark the permalink. I will be hosting a preschool camp (2 days each for 2 weeks) for 2 young nephews in June. If I don’t do your requested theme this time, I will include it then for lunches or snacks. I love character bentos too! I loved getting to vote! What great idea! I voted, and am waiting to see what you make next. What a wonderful idea! I voted character under 15 – because I’d love to see it on my 15 Minute Fridays linky! Whatever you do, I know it will be amazing. This is such a cool idea to have your followers vote! Thank you Rebecca! So far I don’t have a lot of votes but it is interesting to see what readers want. 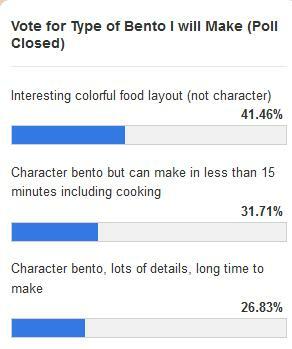 I love that I can vote for the next bento you are making!